Fans around the world saw Michael Jordan play his best games while wearing the Tinker Hatfield designed (and lawnmower inspired) Air Jordan XI, coincidentallly making the XIs one of the most talked about and sought-after kicks in the sneaker community. What makes the XIs so great is the flash of the patent leather along with a carbon fiber plate making these one of the lightest Jordans developed at the time. 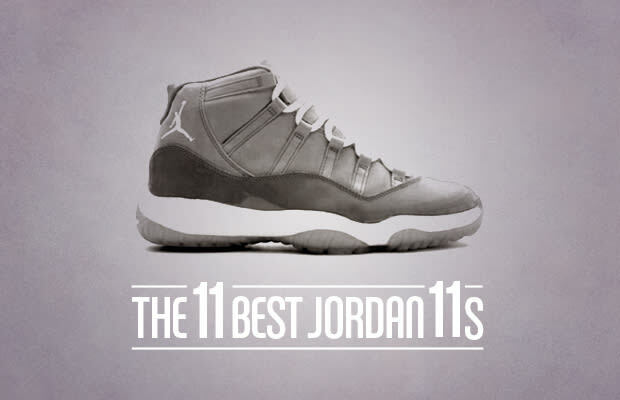 Since today is 11/11/11, there is no better time to highlight The 11 Best Jordan 11s. We stuck with the OG style XIs, no IEs here. We're sure you remember where you were when you first saw Jordan rocking these on the court or have a story behind how you copped a pair or two.